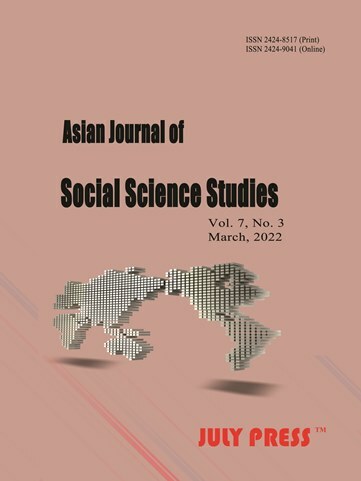 Asian Journal of Social Science Studies (AJSSS) is an international open access and double-blind peer-reviewed journal published by the July Press. The journal is published quarterly (March, June, September and December) in both printed and online versions. Online publication is free to access and download. The journal accepts article submissions both online and via e-mail (ajsss@julypress.com). Each paper published in Asian Journal of Social Science Studies is assigned with a DOI®number, which appears beneath the author's affiliation in the published paper. Click HERE to know what is DOI (Digital Object Identifier). And click HERE to retrieve Digital Object Identifiers (DOIs) for journal articles, books, and chapters.